In the first quarter-final duel against Espanyol Copa del Rey (Real Madrid win 1-0) Casillas has set a new personal record in minutes without recieved goal. There are even 592 consecutive minutes his network untouched. The previous record he the Spanish national team player, writes Marca, was 520 minutes. All of this is particularly interesting when you take into account that Casillas in La Liga reserve of Diego Lopez, and this season only defends in matches of the Champions League and Copa del Rey. The last goal he received in 38th minute game against Galatasaray in the Champions League, and after that he kept a clean goal against FC Copenhagen in the Champions League, and by twice against Olimpic de Xativa and Osasuna and one against Espanyol in the Copa del Rey. 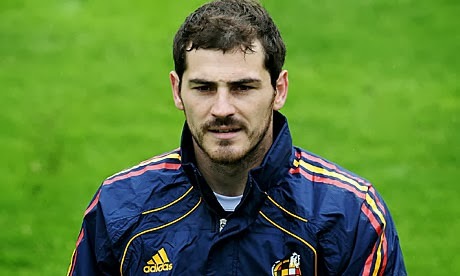 Certainly one of the issues that are constantly repeated is whether Casillas next season suffer reserve status, or whether to stay at the Santiago Bernabeu. "I am pleased with my games. I do not have injuries, form are slowly coming back and catch former level. Feel good, and questions about my future are boring.I am happy at Real Madrid and it's clear to see myself here next season," said Casillas.